It this is true, it's from some very dumb GOPers. She's tough, smart, and runs a near flawless campaign. She'll be a formidable opponent. The crooks knew just what to say to the young teller to get her to cooperate. Two dirty Chicago cops had made sure of that. The robbers knew about her roommate. They mentioned her parents' home address. They even knew about the motorcycle her dad kept -- in his carport, under a cover. Terrified for her parents' safety, the teller did what she was told. She let the robbers into the Richton Park Currency Exchange she had just closed up for the day. Unlocked the vault. And watched as they stuffed more than $107,000 into garbage bags and took off. Someone please tell Tony Peraica (and Andy McKenna) an out-of-control Chicago PD is an issue that's fair game for the GOP. The Progressives won't touch it. Al Sharpton deserves some credit for coming to town, but the GOP is letting Illinois down for not fighting abuses that give no meaning to Reagan's get Government off our backs. House Democratic Caucus Chairman Rahm Emanuel (D-Ill.) made a round of calls yesterday to freshman Democrats, some of whom recently returned from trips to Iraq and made news with their positive comments on military progress. "I'm not finding any wobbliness on the war -- at all," Emanuel said. Strange choice of words here. I find this definition of wobbliness: to move or proceed with an irregular rocking or staggering motion or unsteadily and clumsily from side to side . I think Emanuel means Democrats are not wobbly about withdrawel from Iraq and leaving our Iraqi allies to fend for themselves. I'd say Democrats who could vote for taking-out Saddam and then rock and stagger on finishing the job have gone plenty wobbly about the war. 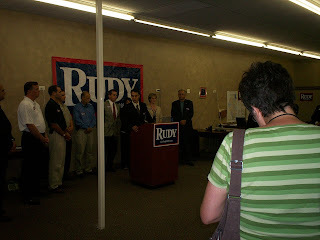 Some pictures from the opening of Giuliani's office in Lisle today. Sorry they didn't come out better. I'm still getting the hang of it. 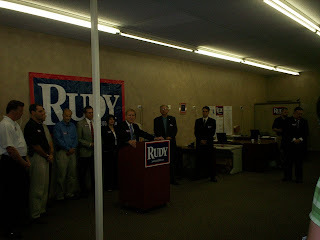 Leader Cross was there as head of the Giuliani Campaign in Illinois. National Campaign Manager Michael Duhaime followed Cross. Aiham Alsammarae: battling Iranians or fleeing Fitz? Eight months after Aiham Alsammarae escaped from a Baghdad jail and returned to his home in suburban Chicago, an Iraqi judge has thrown the book at him, sentencing the former electricity minister in absentia to 21 years in prison in a corruption case. Yet Alsammarae, an Oak Brook resident who had gone back to his native Iraq to serve in the government after the 2003 U.S.-led invasion, isn't exactly hiding at home. He says he recently returned to the maelstrom of Iraqi politics, traveling to Jordan to join other Iraqi officials in forming an opposition front as he continues to insist on his innocence. Reached on a Jordanian cell phone, the Iraqi-American dual citizen, 55, said he is in Amman meeting with Iraqi political leaders in an effort to counter what he says is Iranian influence in the Shiite-majority government of Prime Minister Nouri al-Maliki, which has been prosecuting him. Rezko, 52, is fighting federal charges that he solicited kickbacks from companies seeking state business under Blagojevich. Sources in December told the Sun-Times the feds are investigating Rezko's dealings in Iraq, where Rezko once had a contract from Alsammarae's agency to build a power plant. Makes you wonder if Alsammarae isn't running from Fitz's questions instead? Is it too cynical to think Illinois is training Secuirty Contractors because others feel some day, they may need a spring from the joint, doing it the Chicago Way? After Alsammarae's escape in December, a U.S. Embassy spokesman said the U.S. would cooperate with Iraqi authorities. Al-Radhi said this week that the Iraqi government had not contacted the U.S. government regarding Alsammarae. Alsammarae, who travels on his American passport, said he is unlikely to be arrested, despite the Interpol warrant. He says he had a working relationship with the U.S. government since before the war, and he is counting on U.S. officials to remember his nationality. "I am American, and I don't like Americans to forget that," he said. "Don't all of you wash your hands of me and say, 'OK, bye, so long.'" I'm not forgetting him. I want to know which Security Contractors helped spring him from jail. PJM looks into the Scott Thomas Beauchamp saga and it turns out Beauchamp's married to a TNR fact checker...jeez. I just watched the producer of this film on CSpan. There are lies, damn lies, and then there are statistics. Libération reminds us that Kouchner was a personal friend of UN official Sergio Viera de Mello, killed in the August 2003 attack against the UN compound, along with Nadia Younes, Fiona Watson, and Jean-Sélim Kanan, who had worked with him in Kosovo. Kouchner, former Socialist Health Minister and one of the founders of Doctors without Borders, defends the “droit d’ingérence,” defined as the right to interfere in the domestic affairs of a sovereign nation in order to protect its inhabitants. He disagreed with France’s head-on opposition to the U.S. in 2003, and believes that if France had remained by the side of its American ally, war could have been avoided. Update: A Google Translation from Libération which is a pretty amazing thing when you think about. The ability to translate on the fly like this. Not the trip. You can just picture the Democrats cowering in the cellar, praying not to be attacked, while Republicans hunt down our enemies to smite them first. This is a familiar refrain from Giuliani, who habitually preaches the virtues of military strength, while accusing the other party of planning to "slash military budgets." In his view, the issue of national security is a simple choice between being powerful and assertive or weak and helpless. But where are the Democrats who fit his dire description? I suggest reading Tony Blankley from a few days ago. The wind's shifted and so have the Democrats. "The wind has shifted in Washington. America, not just its president, is at war. The Democrats are still critical of the failed Iraq campaign, but they are no longer opposed to the "War on Terror" in general. It has been accepted, and not just as a metaphor ... Ninety-two percent of Americans are opposed to an immediate withdrawal from Iraq, and a majority doesn't want to see the U.S.'s special detention camp at Guantanamo Bay closed. At the moment, the American electorate's biggest criticism of Bush is that he has not been aggressive enough in pursuing terrorist leader Osama bin Laden. "Indeed, when voters hit the ballot box in November 2008, they will be looking for more than just a candidate charismatic and clever enough to lead the country politically. 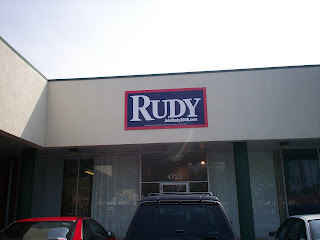 They will also ask themselves which of the candidates is sufficiently tough, crafty and brutal to win the multi-front war that the Bush administration has begun. And it will be trying to square all that Democracts have said on GWOT over the past few years that will make Giuliani (or McCain) President. Problem is, many American diplomats, spies, journalists and academics who focus on the Middle East simply cannot understand the region without the notion of Sunni dominance. The supposedly marginal minorities, such as the Shiites and the Kurds, should always be subservient to the Sunnis, goes this line of thinking. It doesn’t matter if the Shiites and Kurds constitute over 80 percent of the Iraqi nation; “What will the Saudis say?” is the refrain of this crowd. Well, what the Saudis have to say matters very little in Iraq, and once Iraq gets back on its legs and breathes petro-fire around the neighborhood, the Saudis will matter very little across the Middle East. A new paradigm is forming, and many traditional American centers of wisdom on the region are ill-equipped to understand it. A classic exchange between Plante and Tony Snow. The severity of this breach hasn’t even occurred to every Democrat, at least as yet. As the Washington Post revealed, there is disagreement within the Democratic leadership ranks as to whether Thursday night’s stolen vote action was even a mistake at all. Majority Leader Hoyer acknowledged on the floor that it was a mistake, and apologized. But Speaker Pelosi brushed Leader Hoyer’s comments aside, saying there was no mistake, and calling the incident something that was just an “inconvenience” for the Republican minority. Leader Hoyer has it right. It was a mistake -- a mistake that will grow in infamy with each day the Democratic leadership allows it to stand. The stolen vote wasn’t just “inconvenient” for Republican politicians; it was an affront to the millions of Americans we were representing when we offered legislation to stop the Democratic majority from allowing taxpayer dollars to go to individuals who violate the laws of our country. Nonetheless, according to the Washington Post, a “defiant” Speaker Pelosi brushed aside this disgraceful moment in democracy by asserting that Republicans were frustrated. We simply have been “deluged by the success of the Democrats on behalf of the American people,” she said. Andrew Marcus has video of a Sargent who unwisely wore his uniform to Kos and tried to speak but escorted out by VoteVets's Jon Soltz. PJ Media's Roger Simon reflects on it. I had never heard of Jon Soltz before this. He certainly doesn't seem adverse to using the uniform too. Reverse Spin has more here. 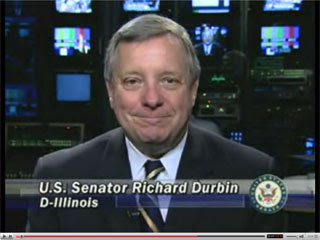 Durbin had to remove the video from You Tube. My guess is Ann nailed it with use of Fed bucks to pay for his Kos speech. The US Congress and Iraq's Parliment: who's calling who dysfuntional? The Crypt writes the House erupts in chaos over Democrats erasure of the outcome on an immigration vote. When Democrats finally moved to consider the spending bill as the last vote of the night, furious Republicans left the chamber en masse to protest the maneuver. The House eventually recessed at 11:18 p.m. But Republicans quickly discovered that there was no longer any record of the controversial vote and immediately charged Democrats with erasing the bad result. The official House website did not show a record of the vote as of 1 a.m. Friday. These are the guys who can lecture our Iraqi allies on political progress? Obama also recommends setting up a partnership program with our allies to "take down terrorist networks" around the world and he, as president, would provide $5 billion over three years to do this. This is worth exploring, especially if, as Obama says, it will not involve "repressive tactics." How in the world do we take down a terrorist with out repressive tactics. Jen needs to explain that one for her readers. Not to mention how that squares with abandoning our allys now in Iraq as the fight the same terrorists. From an Obama email today. Credit the man for at least understanding America's at war. The time has come to turn the page on a failed approach. The next President of the United States must commit to getting our troops out of Iraq and taking the fight to the terrorists. We must reinforce our mission in Afghanistan with additional troops. We must press Pakistan and President Musharraf to close down terrorist training camps and stop the Taliban from using Pakistan as a safe-haven. If Musharraf acts, we will stand with him. But if Pakistan will not act against Osama bin Ladin and the terrorists who killed 3,000 Americans, we will. These are achievable goals, and when I am president we will wage the war we need to win with a comprehensive strategy. The first step to making America safer is getting our troops out of Iraq and onto the right battlefields in Afghanistan and Pakistan. But that's not enough. We must develop the military and intelligence capabilities to neutralize terrorist networks and secure the world's most deadly weapons. Recruiting, training, and equipping our forces to fight more targeted and agile counter-terrorism missions are central to our success. President Bush's refusal to engage our enemies diplomatically has been a complete failure. Unlike Clinton sending Malaine Albright to Pyongyang to dance with some kids. She was taken to a kindergarten, where children put on a dancing routine (Albright gamely joined in). She was treated to a mass performance by acrobats and dancers waving banners and flowers at a Pyongyang stadium. She also visited the mausoleum of the late Great Leader Kim Il Sung. "This is a new one from a historical point of view," said Kim Jong Il. "I'm really very happy." This administration is a little more cautious celebrating diplomatic success. A cautionsness Obama best consider before talk of attacking Waziristan and throwing an ally like Musharraff off a cliff. Since 9/11 Pakistan has been in the forefront in campaign against terror and suffered the most in the shape of human lives. It helped in the arrest of hundreds of Al-Qaeda members. President Musharraf and Prime Minister Shaukat Aziz were made targets by the terrorists for their cooperation to international community to fight terrorism. The present deteriorating law and order situation in the country and suicide attacks are a proof that Pakistan is all-out to defeat and eradicate terrorism. Despite these facts, asking Pakistan to do more and attaching strings with aid meant to fight terrorism is beyond one’s imagination. What have we gained from our support to the international community since the American attacks on Afghanistan against Taliban regime and Al-Qaeda. The money transferred was in return for utilization of our airfields and other facilities and some technical assistance for intelligence in FATA. There must be a realization in Washington that Pakistan had taken the role as a partner in the war on terror in spite of strong opposition on the home front and it did an excellent job. He finally understands there terrorists we fight in Iraq. Whether he realizes it's a war we must win instead of a civil war we must flee, I don't know. But at least it's a glimmer the man understands what's going on. Edwards said the United States should require the Saudi government to shut down the movement of terrorists across its borders, help stabilize the Iraqi government and participate more seriously in regional security before they are offered weapons. "Whether it's Iraq or terrorism, the Saudis have fallen way short of what they need to be doing," the 2004 vice presidential nominee told The Associated Press in a telephone interview. "And the Bush administration's response is to sell them $20 billion worth of arms, which is short-term and convenient and not what the United States should be doing." Edwards is the first Democratic presidential candidate to speak out against the deal. Defense Secretary Robert Gates and Secretary of State Condoleezza Rice visited Saudi Arabia Tuesday as part of a two-day visit with Arab allies that opened talks on the proposed U.S. arms package. Edward's should sign on with the Weekly Standard's Stephen Schwartz: Why coddle the Whabbis?